“Our intention creates our reality” – Wayne Dyer …I have experienced the accuracy of this statement throughout the past two decades of my life. I encountered a powerful shift when I realized that I no longer had to be afraid of reaching beyond what I believed I was capable of. It was through my own EMDR journey that I learned to release limiting beliefs and thoughts and began to experience hope of living passionately every single day. For as long as I can recall, I’ve been intrigued by human behavior and interpersonal relationships. I recall perusing many psychology books throughout my adolescent years. After pursuing this passion and majoring in psychology, it was chance that led me to the Friends University Marriage and Family Therapy training program in 2000. Here I learned the foundational skills needed to become a therapist and discovered the privilege of working with people struggling to overcome various issues. At the time, my therapy practice focused mainly on working with relational systems such as couples and families. As I pursued additional education at George Fox University in Newberg, Oregon I learned a great deal about psychological processes and ways to assess psychopathology. As I moved through the next few years, I began my own therapeutic process with a therapist who helped me release so many limiting beliefs about myself and truly experienced transformation through therapy that incorporated EMDR Therapy. As a client, I didn’t understand the process… I just knew that I was experiencing powerful shifts in my understanding of myself. My vivid, meaningful dreams illustrated that astounding things were happening at a level I could not fully understand and my therapist was there to guide me through the process. I was confident that I would someday utilize EMDR Therapy as part of my own work with others. I continued to work as a therapist and my clientele began to grow, yet, I discovered that I felt limited in some aspects of treatment. I could work with people on resolving family of origin issues, altering distorted thinking, communicating more effectively in relationships, managing stress, and various other issues, however, I knew there was more! There was a missing link that I couldn’t identify. About 4 years into my practice, I received notice that Friends University would be hosting an EMDR Training with Barb Maiberger. 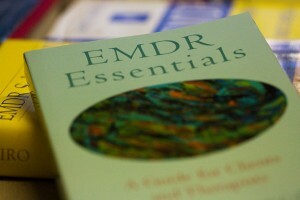 I immediately signed up and began reading all about EMDR Therapy. Because of my own experience with EMDR Therapy, I was not skeptical at all, however, others in my training class seemed hesitant to believe that this type of therapy could be as powerful as it seemed. It was throughout the EMDR Training weekends that I became even more convinced, and saw others who had been very skeptical become believers! Of course, I immediately began introducing EMDR Therapy to my own clients and was astounded by the results. I couldn’t believe how quickly folks seemed to work through very difficult trauma and, additionally, even those without severe trauma benefitted from EMDR Therapy. I had discovered the missing link! EMDR Therapy is body centered and I began to realize that the body not only stores trauma but also can RELEASE that intense emotional pain to assist the healing process. EMDR Therapy combines elements of cognitive therapy, somatic experiences, mindfulness, exposure, and other therapies to heal past trauma and help people envision a different future. I utilized that resourcing component along with desensitization and future template to help alleviate symptoms of depression, anxiety, mood instability, nightmares, flashbacks, etc. This therapy works! I can confidently say that I utilize EMDR Therapy with most of my clients. Since my initial training in EMDR Therapy, I have worked with Barb Maiberger to become a EMDRIA Certified Therapist which means I have provided EMDR Therapy to the required number of people and have completed 20 consultation hours with an EMDRIA Approved Consultant. I have continued to seek additional education and training in EMDR Therapy and have completed Maiberger Institute’s EMDR Advanced Workshops, “EMDR Therapy Tools for Complex PTSD” and “EMDR Therapy Tools and Addiction.” I have had the privilege of working with Barb Maiberger to become a Consultant-in-Training and have been able to provide consultation and training to others. I have been able to assist Barb during EMDR Trainings as a facilitator and am looking forward to continuing this journey. Our intention creates our reality. Throughout this journey, I have discovered that if I set an intention and believe in it, things seem to unfold as they are meant to. Dr. Susan Dutcher is an EMDRIA Certified Therapist and EMDRIA Consultant-in-Training (CIT) with the Maiberger Institute. Susan is a licensed psychologist and licensed clinical marriage and family therapist in the state of Kansas and has been in practice since 2003. She is the Program Director for Friends University Marriage and Family Therapy program and maintains a small private practice. Her career interests include working with trauma, enhancing relationships with couples and families, and training student therapists. In addition, she provides supervision to post-graduate clinicians and is a AAMFT Supervisor Candidate.